Charlotte is Audrey/Mara’s mother! Dwight is shocked that Charlotte has been lying and doesn’t understand since Charlotte is way too young (ignoring the fact that Mara has been around for centuries); she reveals she’s about 1100 years old while Mara is 600. She says the proof of this is the ring which everyone in the family (including Mara) has (because “immortals” is definitely an explanation that is more reasonable than “mass produced crap made in China”). She adds that she’s from a different world, far away, that is separated from theirs – and it should stay that way. Dwight is super huffy and refuses to speak to Charlotte, summoning a guard instead. That damage segues us to Duke at the Gull who is getting tetchy and throwing out Troubles at an annoying customer who shatters several things including another person. Which is really messy. Reports of this reach the police who arm up and are ready to head to the Gull, except a random Trouble seals them in the armoury, much to the confusion of Rebecca and Dwight. Nathan and Audrey plan to head over but Nathan goes to get coffee (Audrey is having a cold spell) and Mara gets in the car with a gun. Unsurprisingly, she refuses to see her mother instead she sends a message – either Charlotte opens a Thinny so she can leave (alone) otherwise Duke will explode and cover Haven in a whole new batch of super-terrible Troubles. She then hits Audrey (just so we’re clear she’s super, and rather gloriously shamelessly evil) and leaves. In the hospital Gloria is causing a scene, possibly to cause a distraction to allow Duke to visit Charlotte and possibly just because she’s ornery. Duke explains his problem and when he takes off his shirt we see he is covered in black handprints. Audrey returns to speak to Charlotte to try and figure out her identity crisis and deliver Mara’s message. Duke overhears their conversation including the fact he’s a Trouble bomb – Duke decides to leave. Because that’s completely sensible; regardless, Charlotte won’t let Mara through alone and she can’t stop Duke exploding. Next Trouble – a group of school kids are trapped on a boat completely encased in animate rigging, ropes and net – and seemingly crushing the boat. Everyone gathers there to try and help remove all the ropes and keep the boat afloat and Dwight guesses it’s the same locking Trouble as the police station. Audrey and Charlotte also arrive and they have a plan to stop Mara – Mara’s personality has been pasted over so many times that Charlotte thinks that if they’re recombined the goodness in Audrey, that has come from Mara(ish) will reform Mara and she will choose to stop. I call shenanigans! When Audrey and Mara were one Mara was very very very evil. Charlotte also adds that the whole 2 people in the same realm reason for Audrey dying is pretty much wrong and reality it’s just one “life force” split into two that is killing Audrey. Nathan keeps saying no like it’s his decision. He and Audrey have yet another of their weepy relationship scenes and he says yes. Audrey does her usual investigating and finds the man linked to both the people in the police station and the kids on the boat – his family has never been Troubled but he was at the Gull when he let some Troubles slip. Audrey talks to the man who fears for his family in the Troubled town – and that fear is causing him to lock them up. Audrey manages to convince the man to let go of his fear by focusing on love and everyone is freed from their traps. That was quick and easy. Dwight and Charlotte briefly talk relationships with Dwight pouty and growly because she never intended to stay and this is so sad despite him only knowing her for a week or so. To the Teagues! Between snark and booze Dave has a weird vision of picking up a rock. They check the books and judging by the trees, Dave’s massacre visions are definitely of Haven. They’re interrupted because Duke goes to them in the hope of an answer – he’s thinking of leaving town but Troubles don’t disappear just because the Troubled person has left Haven. The only safe place would be in the Void – which would require an open Thinny. Dave and Vince know of one in North Carolina, though they try to hide it. Duke quickly picks up that they’re hiding something and threatens them with dramatic violence. This seems to work and Duke keeps making dubious decisions because he calls Mara to tell her about an open Thinny. She agrees to meet him on his boat – but only if he chains himself up first, which he does. After much snarling, his deal is to show her the Thinny and he’ll go with her because he also wants to go through. Nathan follows a few clues and learns from Gloria that Duke and Mara are leaving town in a sea plane. He calls Audrey and she heads to their departure location with Charlotte with more worry as Audrey realises she will completely cease to exist when she merges with Mara – who then appears with a gun. Mara hits Audrey and knocks her down so she can point a gun at her mother and start working on her mommy issues. The bonus of this is revealing Mara is apparently doing this to get her dad back. Or at least that’s part of her goal. Mara also reveals she turned Duke’s explosion off (and she suggests that Charlotte is afraid of working with Aethur). Charlotte keeps trying to appeal to Mara’s better nature so she can make Mara whole again – though Mara doesn’t really want Audrey back. But Charlotte continues to talk about Mara’s feelings and memories, linking some of the loss she feels to the emotions being in Audrey. Meanwhile Duke and Nathan run into each other and Duke reveals his plan, kill Mara on the doorstep of the Thinny then he will jump through before his Trouble bomb goes off (killing Mara triggers the bomb). They’re interrupted by a storm of wind and debris and hurry to where Charlotte is knelt with Audrey and Mara – holding them both. They glow – and then explode outwards, knocking Duke and Nathan off their feet. After which there is only Charlotte and… Audrey. No Mara. Charlotte explains that Mara was “destroyed” by the loss of her father and Charlotte’s attempt to help was just causing her more pain – so she decided to just keep Audrey. They also reassure Duke that he has been deactivated. But this is only the mid-season finale – so we need more drama. A huge storm looms on the horizon which everyone finds ominous – and Duke goes blind as his eyes become black from edge to edge. Oops, it seems “deactivated” doesn’t apply is Mara dies. Charlotte, you done screwed up. Fog now surrounds Haven and, as Dwight finds out when he tries to drive through it, leaving Haven just turns you round. Everyone’s stuck in Haven. And in the forest, Vince and Dave are following Dave’s vision to where they find a rock with “Croatoan” carved on it. Duke unleashes a huge torrent of Aethur from his eyes that flies over Haven before pelting down – Troubling many many many people. So Haven comes down to “ALIENS DID IT!” Ok I assume there’s going to be more complexity – but advanced beings from another planet? Aliens! Despite my snark, I’m actually kind of gleeful we have some answers. I do want to know where Charlotte has been in the last gazillion incarnations of Mara – why hasn’t she tried to fix the Troubles before now? But it’s not just aliens. It’s aliens with daddy issues, which is just kind of sad. I think I’d prefer callous scientists performing experiments on short lived creatures and just not caring. Or even just brutal sadists inflicting the Troubles for funsies. But daddy issues? And let us discuss that ending – Mara was hurt by the loss of her father… I don’t know how aliens deal with grief counselling, but I think “multiple reincarnations and multiple personalities over 600 years” is probably not the best way to deal with that… And when that fails Charlotte decides the best thing for her daughter is to have her entire personality rewritten? This is exactly what I found so disturbing at the beginning of this season. “Audrey is the daughter I loved” uh, no, Audrey Parker is an FBI agent with absolutely no memory of you! Audrey Parker is the person she WANTS her daughter to be. Y’know, if they’d said “Mara is terribad and the only way to stop her rampage of mass death is to kill her and, hey, bonus, Audrey gets to live because of that” I’d respect that a whole lot more than this. 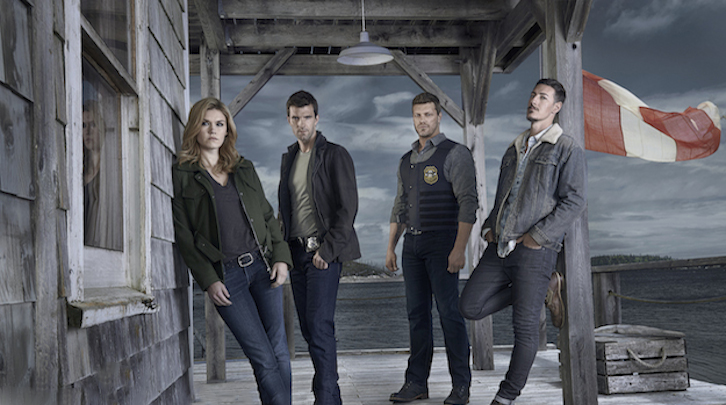 I think there has always been a lot of problems with how Haven paces it’s seasons and this is really apparent in this half-season as well. Most of the season has been bogged down (with a huge amount of really annoying and frustrating relationship issues – this has been a really romance and angst heavy season) with little world building despite all the keys being right there – and then we have all of these questions addressed in one episode that felt really really rushed. Inclusionwise, Haven continues poorly. POC have been tiny random background characters, if at all, no more than extras. After 5 seasons Haven finally remembered LGBT people existed – and they pulled out a couple of extras to squeeze as much insulting appropriation as they possibly could into one episode before dismissing them as the pointless extras they are. Haven did have some more women hanging around this season beyond Audrey (and Gloria is awesome) but I think more could have been done with Rebecca and Vickie. Still at least Audrey isn’t moving in an all male world with women who last a season before dying/disappearing – especially since we started the season with the really clumsy killing off of Jennifer.